You may have seen them in stores and maybe own one or more, but do you know how these beautifully handcrafted pens are made? Let us start with an overview of how handcrafted wooden pens are made. First, choose the wood you will use from the large choice available. Then cut it to lengths two and one half and 1/8th inch. You use a professional saw to cut it to size. The next step to drill a seven mm hole down the centre of each of these blocks. You must be very careful in drilling this hole. You first drill a hole to a certain length and then go again slowly. If you try going all the way down in one go, the wood has a tendency to split and explode. 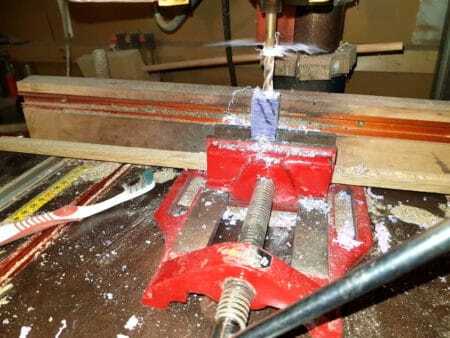 The third step is to get a 7 mm tube and glue it into the centre of the hole. We call these tubes pen blanks. Now is the time to turn these square blocks into the round. 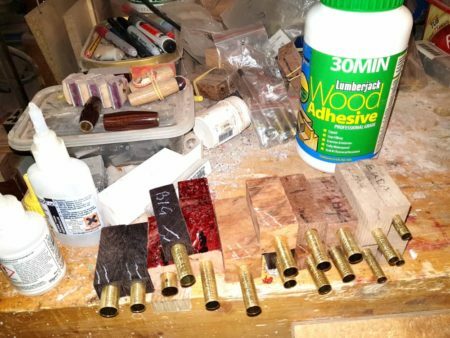 Once you have hand turned the pen blanks down to size and shape you desire, then the sanding begins. Working through the grits from 120 through to 600 patients and time needed. Now the next step applying superglue and finishing the handcrafted wooden pens. The next step to assemble the pen. You first put in the pen tip with a custom-made press. Now you need to put in the twist mechanism. Then you put in the ballpoint pen refill. Put on a little sleeve. Now you fasten the clip. Put the top part on the pen. And there you go job done and a ballpoint pen made! So that’s more now you know about handcrafted pens. You always were fans of these beautifully handcrafted wooden pens for sale at various stores, shows and events. Did you never wonder how they were made? These beautiful pens appeal to writers of all age groups, a child, a young man/woman, a professional or in retirement. They kind of make you stand out of the crowd, something not everyone carries in today’s mass-produced products world. 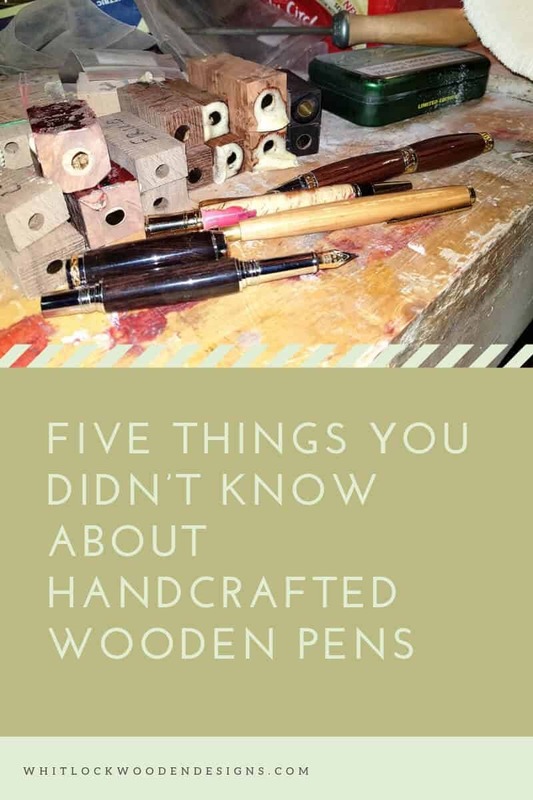 Not only did you not know (or maybe you did) about the manufacturing process for handcrafted wooden pens? Here are fun facts you may not have known about for these handcrafted pens. Did you know handmade wooden pens are not only just the more common ballpoint pen refill type but also come in the in the form of Handmade Fountain Pens? The various designs on the market reveal the creativity and uniqueness in each fountain pen. Each fountain pen has an exclusive theme and made from the best material which will generate the exclusive sensation of the fountain pen. Most of the fountain pens are perfect to be given away as gifts but well suited for regular use. Though not the most expensive luxury fountain pens, the prices reflect the nominal costs of creating such authentic fountain pens. When given away as gifts, these fountain pens deliver all the love and thought that has gone into the buying process. Fountain pens happen to be still greatly appreciated and high in demand in many gift occasions. A lot of fountain pens happen to fall in the class of luxury pens and made in the most gorgeous designs. Pens which fall in the category of Handmade luxury pens often a different kind of fountain pen gaining more and more attention? These pens typically made from exclusive, exotic materials and finished with beautiful textures. These are also created in different varieties and designs to match the tastes many users. Although handmade fountain pens do not form the highest priced luxury pens, there very much ready to contend in appearance. These handmade fountain pens provide a substitutive option for lovers of fountain pen who are on the lookout for a new and authentic look. Did you know that you can get handmade pens in a sort of cigar box design? You must have seen single or a set of both cartridges based and handmade fountain pens being sold? They look exquisite and make for a very classy looking pen gift for someone as your boss or someone graduating. These cigar type boxes containing fine looking and beautiful handcrafted wooden pens and handcrafted fountain pens also make for a collector’s choice. You will not believe how much the price of such antique collections can be! Did you know how many different colours available for the handcrafted wooden pens? You may have witnessed light, medium and dark shades of wood as far as the colours of the handcrafted wooden pens go. You will be surprised to know that these handcrafted pens are available in a lot more colours than you can imagine. This is the world of handmade wooden pens? You can get to choose Black or Blue too. Sounds unimaginable, right! Wooden pens in blue or black colours but there available, believe it or not. You can also find different colours depending on the kind of wood used, for example, purpleheart or wenge. And this just the beginning, you can choose from more exquisite colours like chrome, gold, silver and gunmetal shades. Did you know that you can find handcrafted wooden pens with elephant tops? You may remember the pencils we all used to have with erasers on top. Do you know that you can find handcrafted pens with decorations like elephant head, or dolls n top of the handcrafted wooden pens? Some even come with a wooden initial of your name. Did you know what you can have your pens engraved? Want your pen to be a reflection of you, you can get these handmade pens engraved for your personal taste. That is all folks, we are going to leave you with a website where you can get this and more http://www.whitlockwoodendesigns.com/ Alternatively you can find me on facebook or any of the other big social networks.